LOL, Coal certainly is uptight for a dead guy. “The Happy Walrus” would be an excellent name for a pub. Hm, I’m tempted to believe that Coal might be buried there, but then I’d have to wonder where he got his first boat from. And I didn’t even think he was buried in the first place. I thought those boats were set on fire and pushed out into the sea. But I guess I’ll see! Sage advice! Let’s see if she takes it. I cant believe it took us a thousand years to invent cups with handles on them. Oh well, it took five thousand to put wheels on our luggage. MMMM, this is good, it smells like that blue stuff kept under the sink. You wouldn’t want wheels on your luggage on the sorts of roads they had five thousand years ago. They would just get stuck in the mud. Ha! I remember thinking “why hasn’t she drawn Hedda’s hands in the last panel yet?” when I was watching you work on this page in livestream XD Now it makes sense! Also, yaaaaay Loki sketches! They are the best. I love the Thor-and-awkward-Loki one. Haha! Yeah that’s why. XD I’m a cheater stinker. Thanks! It’s not a good means of escape, but then she’s kinda short on those. i really can’t read the first three panels. mebbe it is just me. dial up is depressing. hey, what is livestream, and can we really watch you work? i love work, i could watch it all day! lol! 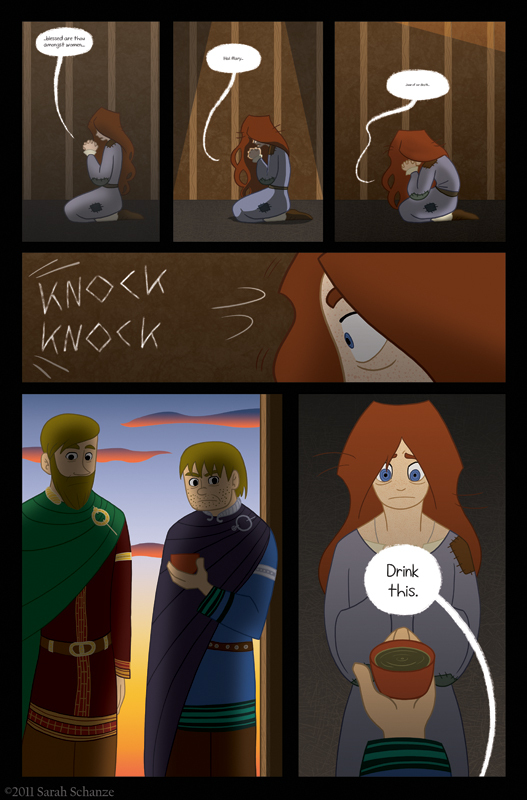 The first three panels are just Hedda still praying, it’s not important if you can read them. They get smaller as they go because Hedda’s getting more and more tired. And yes! Livestream lets me show my desktop when I work on a page, and people can watch. I announce any livestreams on my Twitter. XDDDDDDDD Lovin’ the comic, my dear. Also, the light in the first three panels, before the knock happens…? It makes it seem as if the door is opening, and yet they knock after… I don’t know, seems a little strange to me, but perhaps you meant it that way. ^^; Excited to see what happens next! Thanks! Actually the light is supposed to mean that time is passing, there’s a hole in the ceiling over her and it’s affecting the light in the room. Guess it didn’t get across right. Oh well! What’s everyone so upset about? It’s just green tea… or hemlock, I get those two confused. It’s not good, whatever it is. Wow, she was praying consistently for a while it seems. The man died in the morning, then? Or am I messing up on where the light is coming from in the roof? Also, I really like the brothers clothes in this one. Loki looks so cute in mope mode with Thor. xD Lost a bet or a bad haircut? And the last one is probably my favourite: He’s just like: Wait, there appears to be people staring at me..? No you’re right on the timeline. He died early morning and it’s evening now. I’m glad you liked the page and incentive! Thank you! Go ahead, Hedda! Smack Shorty a good one! Whaddya got to lose? . Poor Hedda; I don’t really think there’s muhc you can do now. Wait, is this The True Origin of Panhellenic Organizations on US College Campuses??? ?